Guilt-free sugar-free snacks, which still taste very sweet. For licorice lovers only, this recipe is quick to make, satisfies your sweet tooth, and provides plenty of nutrients, including protein. I personally can't resist these, the flavour is out of this world! You will love this recipe if you struggle with sugar cravings, if you don't want to spend too much time preparing snacks, and if you want to save money. Snacks are one of the easiest things to spend money on, so for frugal enjoyment, make a huge portion of these and keep them in the fridge. Warning: You may eat them all too quickly like I do. The only challenge is to locate a good source of licorice powder, which is the pure ingredient but 'processed', not raw. Yield: 40 balls, 1" diameter, approximately, as shown on the picture. 1. Puree prunes, using a food processor, nut-butter function of a slow juicer, or pulsing function of Vitamix. If you don't own these tools you can cut and mash the prunes until they form a fine puree. 2. Puree almonds and hazelnuts into paste the using the same methods. 3. Mix all ingredients together in a bowl, run through processor once more if necessary. 4. Taste and adjust the licorice amount. 5. Roll into balls using your hands. 6. 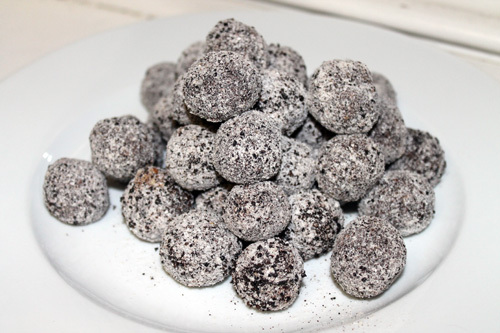 Coat the licorice balls thoroughly in your choice of one of the following: coconut flour, chia seeds, more licorice powder (if you really love a strong licorice taste like me, or any dried fruit powder. 7. Ready! Enjoy your sweet, guilt-free snacks of licorice heaven! First of all, you have to love licorice. If you don't, you won't like this. The flavour of this recipe is all about the sweetness of the prunes mixed with the sweet licorice taste. Secondly, you will need a good source of 100% processed licorice, with no added ingredients. I got mine from Allthingsliquorice.co.uk, what an amazing shop for a licorice lover like me. Raw licorice powder, which is sold as a superfood, will not work here because of its different flavour, and also, raw licorice can only be eaten in small quantities without side effects. 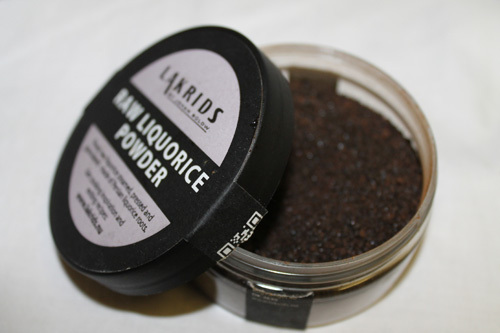 The licorice powder should look black, be pure licorice, and taste nice on its own. The licorice powder I used for this recipe. Licorice is a brilliant sweetening ingredient in sugar-free snacks and desserts because of its natural sweetness reduces the amount of sugar needed. And being processed-sugar-free is one of the most important dietary choices to be healthy! In addition, the sweetness of dried prunes leaves you missing no sugar. Even with my extreme sugar intolerance, I have noticed no bad effects from this recipe. And it helps to curb my sugar cravings. The protein from the nuts, as well as the fibre from the prunes, will help to release the natural sugar content slower. You could also experiment with adding small amounts of superfoods into these, as long as it's not too much to interfere with the flavour. This sugar-free snack recipe was inspired by Rawrawcakes.com.